This film is the second in our sequence of LGBTQI-Jewish ‘ritual year’ documentaries. The film consists of a clips of a memorialisation service and ritual activities, interspersed with short discussions with LGBTQI Jewish activists (including a Gay Rabbi) who participate in a memorialisation event which is explicitly Jewish in format and which was designed to offer an opportunity to mourn, remember our dead and have hope for the future in a specifically Jewish context. One key element of this film consists of the incorporation of the ‘Aids Quilt’ into the ritual process. This beautifully made object was created by a Jewish gay man and is curated and preserved by Rabbi Mark Solomon who is a key discussant in this film along with other Gay Jews. The quilt incorporates embroidered and appliqued richly coloured Jewish symbols, Hebrew text and symbolic representations which enable both Gay and Jewish identities to be publicly displayed and celebrated including (as discussed) within inter-faith World Aids Day events. The film (which captures a World Aids Day event for 2014) takes place at the Synagogue located at the Headquarters of Liberal Judaism in London, at which location a World Aids Day Shabbat always occurs through the auspices of the Jewish Gay and Lesbian Group. Other Jewish World Aids Day Shabbats also occur elsewhere in the UK and in other global contexts, although frequently not with a specific emphasis on LGBTQI identities. World Aids Shabbats always takes place on the nearest Shabbat prior to World Aids Day. This is the second event in our LGBT Jewish annual cycle, as our sequence of films commences with Autumn/Fall; at which point the Jewish New Year occurs, allowing us to move through the ritual year in both Jewish and LGBTQI time, as we explore specific enactments and configurations which reflect the lives and spirituality of people who are both LGBTQI and Jewish. As is common to most of the rituals shown in this series (with the exception of the Pride Seder – Film 5) the religious and ritual elements are ‘pre-created’ with volunteer participants in advance of the ‘actual’ service; so as to avoid the disruption which could potentially occur during this important memorial event if a camera crew were present. This is particularly important as the team and rabbinic representations are collectively utterly opposed to creating barriers to participation for people who come to pray and mourn (or in the context of other services, celebrate) but who may not wish to be part of a film. World Aids Day was first initiated by the World Health Organisation in 1988 as the first global health day, created as a way of raising awareness about HIV+ and AIDS and dispelling myths and stigma. It has a different core theme each year which enables the needs of different groups of HIV+ people or individuals with AIDS to be highlighted; for example focusing on young people; pregnant women; gay men, etc., or emphasising public health priorities. The World Aids Day themes for 2014 and 2015 were, respectively: Closing the gap in HIV prevention and treatment and Fast-track now to end AIDS within a generation. 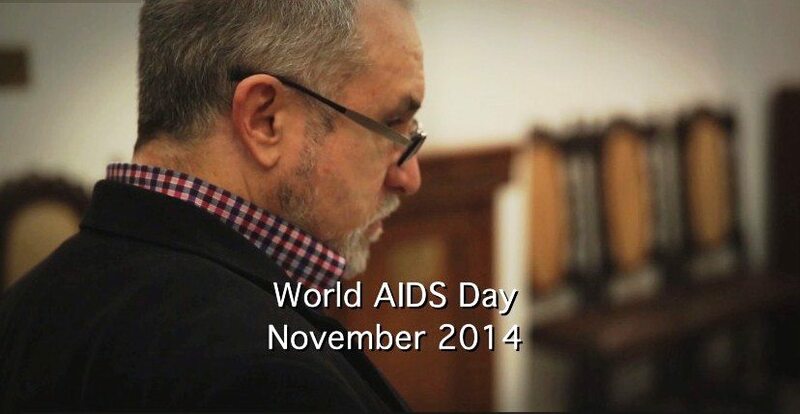 What are specifically Jewish elements in the World Aids Day service as shown in this film? World Aids Day Shabbats have taken place within progressive Jewish communities since the 1980s, enabling us to reflect on the spiritual and social impact of HIV and AIDS on Judaism and Jewish communal life; as well as enabling us to consider how we as members of Jewish communities can support people around the world who are HIV+. Rabbi Solomon talks about his personal journey as a former Orthodox Rabbi who is now a member of the Liberal Rabbinate, reflecting on his membership of the Jewish Gay and Lesbian Group (JGLG) which has always met at the West Central London Synagogue (of which Mark was formerly the Rabbi) and his personal and spiritual commitment to memorialisation of those who have died of AIDS. Other Interviewees refer to the influence and impact of the cutting edge Jewish Gay and Lesbian Group which was formed in the 1970s and which was central to developing the rituals performed on screen within this film, as well as their personal spiritual and emotional responses to participating in this ritual. In addition to the discussion of the traditional Jewish (and LGBT) symbolic elements incorporated within the Quilt which is so central to this service; this film incorporates the lighting of candles which are inextricably bounds to Jewish religious and ritual activity; and extracts of sung liturgy in Hebrew in which traditional melodies and prayers are adapted to include reference to those who have died from AIDS. Within the film there is an emphasis on ‘remembrance’ and ‘memorialisation of those who are dead’; in particular through the saying of the Mourners Kaddish (the Prayer said in Aramaic which was the vernacular spoken by Jews, at the time when this text first became part of liturgical practice during the Second Temple period: prior to 70 BCE). Shabbat is the ‘day of rest’ or holy day within the Jewish faith, on which, work should traditionally not occur and the day is marked out by attending services and studying religious texts as well as spending time with family and community in a manner which is distinct from ordinary working days. In Liberal Judaism and progressive Jewish traditions Shabbat is seen as a time to ‘recharge one’s spiritual batteries’ and often entails having time to enjoy pleasurable activities with friends and community which enable time for reflection on the world and our place in it, for example going on a country walk, gardening, taking long sociable meals, etc as well as providing opportunities for philosophical or theological debate. Jewish ‘festivals’ and Shabbat always commence in the evening, traditionally beginning at the sight of the first star on the designated date, and continuing until an hour after the last star appears, when Shabbat or a festival ends. Shabbat occurs on a Friday night and lasts until Saturday evening.